Sales is a giant subject and I’m not long winded, so I’m not going to go into a hundred little sales techniques. Also not going to talk about ways to convert inquiries into purchases. Others have covered that ground far better than I can. I hope you take time to read some great resources about general sales and especially internet sales. Posted in Nov 2015, making room for babies already?! We’ve all seen the selling shenanigans – The repeated posting of the same animal with the price dropped. The phony excuses: “I need to make room for new babies,” or “If it was worth that, it would have sold already.” Then there are the guys that just throw everything out at 50% pricing because they are too lazy to actually support the market. The amazing thing is all the desperation and even the crazy cheap pricing will often not actually produce results! This is because people just don’t understand the simple facts of finding buyers, and not everyone’s personality is cut out for success in this aspect of the market. Its been a learning curve for me as well, but here are a few things I’ve learned. The massive variety is the best – and hardest – part of our market. Amazingly, sellers will start dropping the price almost immediately after listing… and won’t stop dropping it until someone that doesn’t even want or need the snake, finally breaks down and buys it. I wrote about this in my Auction Article. I have no problem with auctions if they are well executed, with the #1 factor being the audience size. 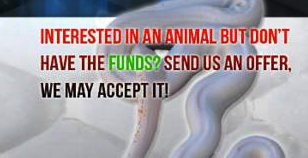 I think the Reptile Ring really has the right idea on doing Auctions in a professional way. Auctions in general though, (especially facebook no-reserve auctions with a small audience) can force a sale during a time there are not serious buyers in the market, or at least not viewing that auction. Savvy sellers discover its ok to sit on animals that aren’t selling for a while. I often hatch something in the fall and literally nobody will ask me about it for months. I’ll think “are people crazy? How is it that nobody wants this snake!” or I’ll start to wonder if I have it priced WAY too high. Until the day I get the the call – “Wow! I can’t believe you have that combo available. I’ve been looking everywhere for one!” They are thrilled to pay asking price. The right buyer will find you if you make yourself available and are patient. Putting your animal in front of the RIGHT buyer is 95% of the battle. Price is the other 5%. You can’t live and die by the almighty price point. It’s important to be competitive if your selling something that has significant competition on the market. But if you always HAVE to beat the best price out there in order to make a buyer move, you need to consider making higher quality animals. Amazing animals make a huge difference. Especially when you present them well. (Some fantastic tips on that from Raphy). Instead of just extracting whatever values others have built in a morph, consider creating value yourself. Do you believe in your projects? What unique angle have you chosen? Its your passion that will inspire your customers. I see sellers complaining that “nobody is buying”, yet they can’t be bothered to take a quality photo or answer inquiries politely. They are right. Nobody is buying from THEM. The Bible says “You will reap what you sow.” Set out to make something great. Build value and you will reap that value. With JKR projects, my goal is to make animals that nobody else has available, but even if you can find them elsewhere, you may pay 10-20% extra to get them from me. I’m not the guy you’re going to get the best rock-bottom deal from, and I lose sales because of that. I’m ok with it. (My customers know I take good care of them too.) In the beginning I paid like crazy for the best founding stock I could get. Even over-paid at times because I was sooo green… But then I put years of selective breeding into them from there. The animals speak for themselves. The extra $100 or even $1000 you may spend now will compound EXPONENTIALLY when you in turn have animals that sell themselves! I have to say something in this section about over production. There’s no magic number for production. Some of the biggest breeders are set up for production and supply the large-scale market. The average hobbyist has no idea about the level of production it takes to supply millions of entry level reptile buyers around the world. Putting these animals in hands of new people is the #1 way this hobby will continue to grow. Being in that slice of the business is HUGE. Huge work, giant expense and if done well, great profits. Its also cut throat. Think carefully about what you’re getting into when you plan to make production your goal. The reason I’m taking about production along with sales, is they are 100% correlated. I hate to see budding businesses of Facebook that have big lists of cheap animals, are complaining that no-one is buying, and then just days later I see them posting on social media that they are planning on doubling production next season! They are working on the wrong side of the equation. Anyone can put two snakes together, instead build distribution and an audience. If you can’t sell them, don’t produce them. If you don’t have the space to keep hatchlings until you can find a retail buyer, either build the space or don’t produce them. If you take one thing away from Part 4, I hope its this: Unless you’re working in the wholesale / supplying aspect of this industry, sales have little to do with the price point and everything to do with quality, marketing and reputation. If you live by price alone, you’re fighting a losing battle and will die by the price. There will ALWAYS be someone willing to go lower. Make amazing products –> sell with integrity –> turn customers into repeat customers = business success! Always very insightful, sir! I read every bit of this manifesto! Excellent manifesto Justin. 🙂 I agree with everything you have said. Thank you for your insight. All the best for the coming season. I randomly found this website after seeing you on YouTube. What a treasure trove. You are a very intelligent individual. Great post. I am loving the manifesto series. I think the Raphy link might be broken though? I only see tech videos on his youtube channel. Also, could you link to some things you referred to when you said that others covered the topics of converting inquiries to sales and things like that? Weird. They’re showing up today. I was wrong. Sorry!